During Wednesday evening's Republican debate among presidential hopefuls, CNN's moderators asked GOP candidates Carly Fiorina and Donald Trump about their experiences as former CEOs in the business world. Fiorina, who was previously CEO of Hewlett-Packard, criticized the way Trump ran his casinos, saying he "ran up mountains of debt," while Trump criticized Fiorina for her management at HP. The most interesting part of the exchange, though, was when Carly Fiorina said Steve Jobs had personally called her. Trump has previously said Fiorina ran HP into the ground and fired thousands of employees, and CNN moderator Jake Tapper asked her why voters should choose her, rather than Trump, if they're looking for a candidate with experience in the business sector. 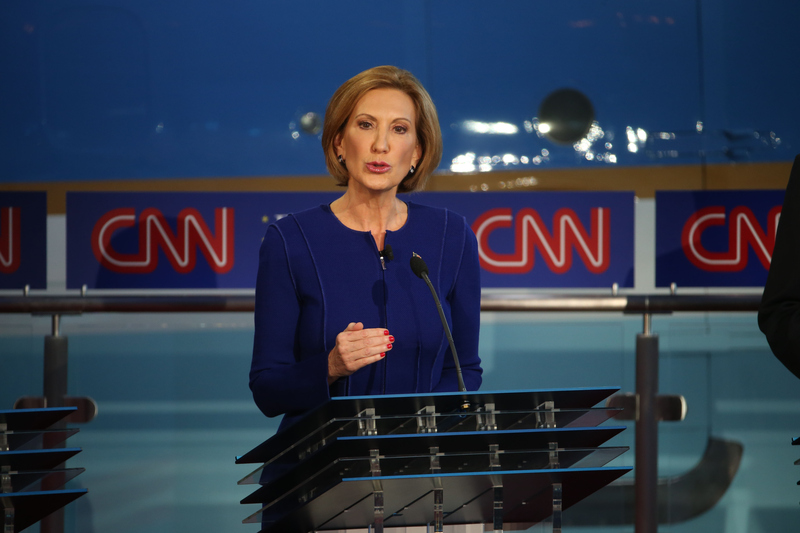 Fiorina said that she ran HP during a "difficult time," as the NASDAQ stock index had fallen. "Yes, we had to make tough choices," Fiorina said, responding to criticisms of her management at HP. "And in doing so, we [HP] saved 80,000 jobs." Fiorina added that when she was fired from HP, Jobs called her on the phone and said that he'd "been there, done that — twice." Wednesday's debate wasn't the first time Fiorina has shared the anecdote about Steve Jobs commiserating with her job loss. In an interview with GQ's Jason Zengerle, published in August, Fiorina told Zengerle, "Steve Jobs called me that very day and said, 'I've been fired twice. That's what happens when you rattle people's cages.'" Just because Jobs may have called Fiorina after HP laid her off doesn't mean the pair were best friends, though. And as the Independent Journal Review's Mark Yzaguirre notes, Fiorina's situation isn't exactly comparable to Jobs' — Jobs returned to Apple after being laid off, while Fiorina wasn't invited back to HP. Still, Fiorina's response showed her ability to think on her feet and hold her cool against Trump, even if her track record at HP is up for debate. Her retelling of the conversation she had with Jobs also comes at an opportune time — during the debate's livestream, several trailers were aired for Universal Studios' upcoming film Steve Jobs, starring Michael Fassbender, Kate Winslet, and Seth Rogen. With multiple films dedicated to Jobs' life and the fact that the mention of a single conversation with him still pulls so much weight for her, Fiorina should hope that she continues to become more like Jobs as she creates her own legacy — one that doesn't end with being fired from HP.